When you paste content from another application into an AutoCAD drawing, the OLE Text Size dialog box opens. AutoCAD picks up the font and point size and lets you convert text to your drawing’s units. Change the value in the Text Height box and click OK. AutoCAD adjusts the size of the text. You can change the text size later, as well. Select an OLE (pasted) object and right-click it. 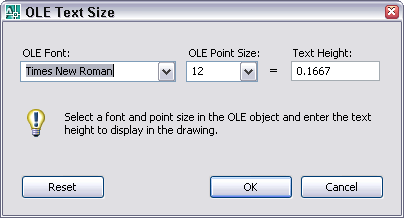 Choose OLE > Text Size to open the same dialog box. Interestingly enough, this technique works to scale all objects, including images that are not text. Unfortunately, the exact results are difficult to predict. Here, you see the word “Client” to the left, created with the MTEXT command at .2 units. To the right, you see an OLE object set to .2 units. You can see that the OLE text size is not accurate. Nevertheless, you can use the OLE Text Size text box to get approximate results quickly, without having to do any calculations. Trying to figure out how to set the height of an AutoCAD font style to match a Word font I came across your observation on the OLE topic. The link above sheds more light on why there is a difference. It has to do with the space allowed for ascenders and descenders. (a) Three typefaces with the same body size but different x-height fractions (in parentheses), from left to right: Lucida Bright (0.53), Times Roman (0.45), Centaur (0.37). The letters are aligned at the baseline. The white “gaps” between ascenders or descenders and their respective guidelines are components of the body size. (b) Three versions of a typeface, Lucida Bright, with the same x-height but different ascender–descender lengths, corresponding to the proportions of the three typefaces of (a). From left to right, the approximate body size progression is: 1.0, 1.17, 1.43. So to get Times New Roman to match, the AutoCAD equivalent for 12 point would be 0.45 x 12/72 or 0.075. That’s close to my visual check on a small test I did with AutoCAD and Word.